The Voltower, Earth’s first and only height-adjustable power strip is now live on Kickstarter. The Voltower is a truly innovative power solution that cleans up annoying cord clutter, and eliminat es the “cord-crawl” forever. It might just be the first power strip you actually love. A recent survey showed that the average American owns four electronic devices – all of which have a limited battery life. “As we constantly need to recharge, it becomes painfully obvious that we need a better more convenient power solution,” says Dean Rosenblum, the Voltower’s inventor, and Founder of Abov Power Solutions. 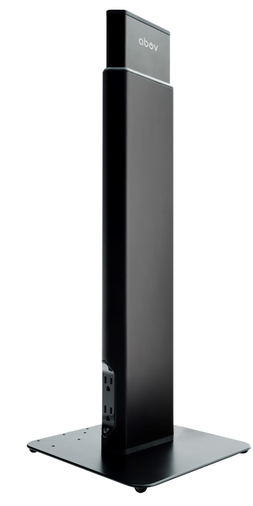 Simple Elegant Design & Uncompromising Quality: Streamlined tower and distinctive diamond shaped profile; casings made from solid aluminum that is extruded, then CNC machined, bead blasted and anodized for overall beauty and durability. Robust, Thoughtfully Integrated Power Supply: Capacity for up to 10 devices, including six standard electrical outlets; and four fast-charge USB ports, that allow users to get rid of their charging bricks. The 5 volt / 2.4 amp USB power output is ideal for efficiently charging both cell phones and tablets – at the same time. The Voltower is grounded and surge-protected so devices have not only the power, but also the protection, they need. Smartly Configured to Fit Seamlessly into YOUR world: Height-adjustable from 25 – 36 inches. Easy and flexible, “no tools” required mounting in five different positions; and cord routings make the Voltower a truly innovative power source that easily integrates behind, in between, or next to furniture. The Voltower is now live on Kickstarter through April 2, 2016 with expected delivery in the fourth quarter of 2016. 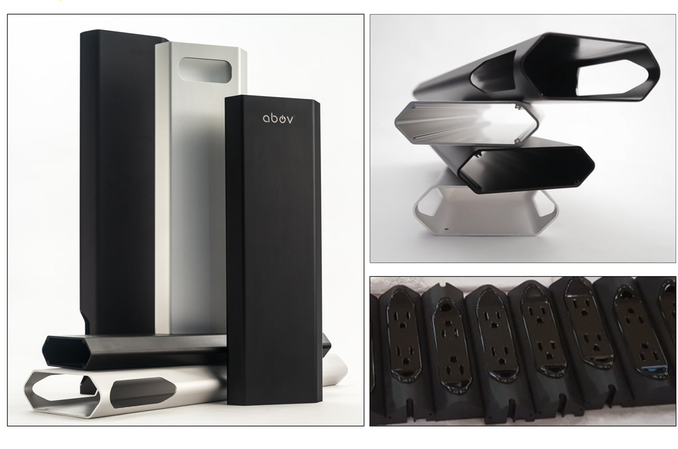 Abov™ Power Solutions (pronounced “Above”), is a Philadelphia-based, startup dedicated to the development of innovative solutions that address pervasive and persistent power-related needs in an ever-increasing mobile world. The Company’s founder and Voltower’s creator, Dean Rosenblum is the quintessential renaissance individual, a chef by trade who also holds a Master’s of Business Administration from the University of Chicago Booth School of Business. The Company, which designs products for both consumers and businesses is fully committed to providing uncompromising quality, while maintaining the highest standards for ethical and sustainable business practices. The Company is also committed to having a positive social impact thru what they call “Power With Purpose” (PWP). To start, Abov will be contributing 5% of its net operating income to organizations and nonprofits working to close the “digital divide” right here in America by providing access to technology, connectivity and education to individuals and communities in need. For more information, visit their website at http://www.abov.com.